I'm a C# developer located in Copenhagen, Denmark. I love simple solutions solving complex stuff. Also I'm one of the founders of Servant.io. I’ve been using cmd.exe with Console2 for a few years now. I haven’t spent much time trying to optimize the experience. Actually the only reason I’m using Console2 is for my copy/paste needs. Until my friend showed me a screenshot of his new Powershell. It had nice Git integration with colors and auto-complete. My own console was stupid and colorless. Time to geek out. The steps below requires that you already have Git installed and configured. If you haven’t already go install Chocolatey. You can now run Console2 by hitting Win Key+R and enter console. It’s plug and play. Nothing more to do. If Console2 is already running please restart it. We need the post-git modules imported. Next, go to Edit -> Settings.... Select Tabs. Select Powershell and press the Move upbutton until it’s in the top. Mark the Use default checkbox. If you like you can set your Startup dir (mine is C:\code). In the same Settings window now select Hotkeys. Find Paste and change the hotkey to CTRL+V. You can now paste text into the commandline using CTRL+V! Save the file to your machine and add a reference in your $profile. Please notice all changes made to $profile requires restarting your console. Last, here’s a nice wallpaper for your screens! Do you still manage your web server through remote desktop or IIS Manager? Try Servant.io today! 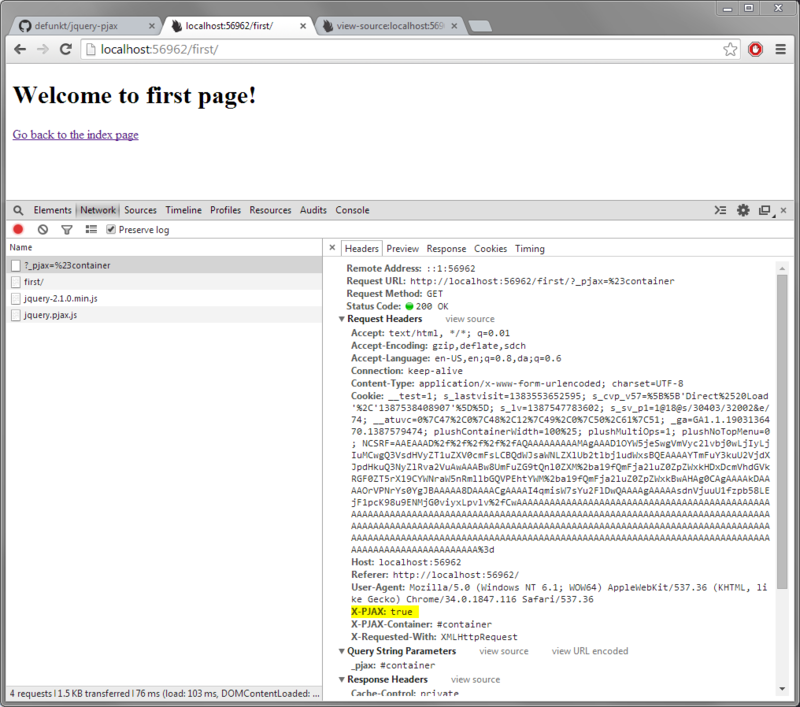 Yeah, I just used drag and drop to deploy a website to my IIS. I don’t wanna brag but I really think it’s awesome! Behind the scene we use the browser to pack and compress your files into one zip archive. Then we upload this zip to a hidden URL. The zip is only stored in memory and it’s automatically wiped after 5 minutes. Now we tell your Servant Client (meaning your web server) to download the zip, extract it to the specific site (into a new folder) and change the site’s disk path to the new location. By deploying to a new folder we also remove the seconds of downtime you normally experience when using the same-folder-strategy. The new folder name will include a timestamp. We will extend this deployment feature with history, auto warm-up and error detection with automatic roll-back (no ETA yet). What do you think? Cool and useful or a complete waste of time? Leave a comment! Some of you may already know about Servant for IIS - a lightweight web interface for IIS (Which is still available at GitHub of course). Servant.io is the next step in making management of web servers even easier and much more awesome. What we have done is simply move Servant to a hosted cloud environment like you know it from Boundary, New Relic and services like that. We have developed a small client/agent to be able to communicate with your servers (the source is open and available for everyone). We’re working like crazy apes to bring new features. Below I’ll list the features we have pushed live so far. Web farm support: One of the biggest feature requests on Servant for IIS was multi-server/web farm support. Servant.io now fully supports IIS web farm setups. You simply select one server to be your primary configuration, and Servant will take care of keeping your sites in sync. Deployment: We bring automated deployment to both single servers and web farms. You upload a zip file containing you site, and Servant will extract the site on every server. Servant always extract to a new folder when deploying, and it doesn’t change the path until the site is completely ready. This dramatically reduces downtime on deployment. Plug and play: One super important thing for us is that it won’t be annoying to install the Servant Client. To overcome firewall issues we communicate entirely on port 443 (HTTPS). We use WebSockets (SignalR actually) to send commands to your server so you don’t have to open for incoming traffic. All communication is of course securely done via SSL. Security: Everyone knows that no software is completely secure. We do a lot to keep Servant super safe, but if something bad happens we introduced a completely automated and silent updater. This makes us able to push security fixes instantly to your server. Everything is happening without any effort required by you. Your Servant Client will always be up to date. We have endless numbers of features that we want to introduce, but right now this is what we have in the official pipeline. Drag and drop deployment: Simply drag a folder from your disk onto your site in Servant, and we will handle zipping and deploying. Deploy from Visual Studio/IDE: We’re developing support for deployment (server + web farm) via FTP. This will enable you to deploy to all your servers directly from Visual Studio/your IDE. Powershell/command line access: You will be able to execute commands and powershell on your server directly from the Servant.io web interface. Executing commands on every server in a farm will also be possible. Servant.io is currently in public preview which is completely free for everyone. When we feel like the product is worth paying for, we will introduce a price model. I promise prices will be fair and will match the size of your organization. Also we will have a discount for students + completely free for open source organizations! That’s all for now. I hope you’re as excited as we are. We want to bring the best web server manager ever. What is PJAX and why? Today most web applications use a layout page, because we need to maintain the same HTML code over multiple pages. This HTML could be the header, footer and so on. When the user clicks around our application they need to download this header and footer again and again and again. Quote from https://github.com/defunkt/jquery-pjax: pjax works by grabbing html from your server via ajax and replacing the content of a container on your page with the ajax’d html. It then updates the browser’s current url using pushState without reloading your page’s layout or any resources (js, css), giving the appearance of a fast, full page load. But really it’s just ajax and pushState. Also, please notice that PJAX is also part of the YUI library: http://yuilibrary.com/yui/docs/pjax/, however I will use the standalone version in this demo. I’ll go through setting up the demo application real quick, since this article isn’t about Nancy, but PJAX. If you’re new to Nancy I suggest you start by reading my getting started on Nancy blog posts. After installing Nuget packages I move the script folder into another folder called “Content” only to follow Nancy conventions. This tells PJAX that whenever a user clicks a link, the content should be loaded into #container. The exact same behavior as Razor’s @RenderBody(). Now when I click through my application I will see that PJAX now sends each request using AJAX instead of regular pageloads. You’ll also notice the X-PJAX: true header (marked with yellow). This tells our application that this request should not contain the layout HTML, only the new HTML for the requested page. 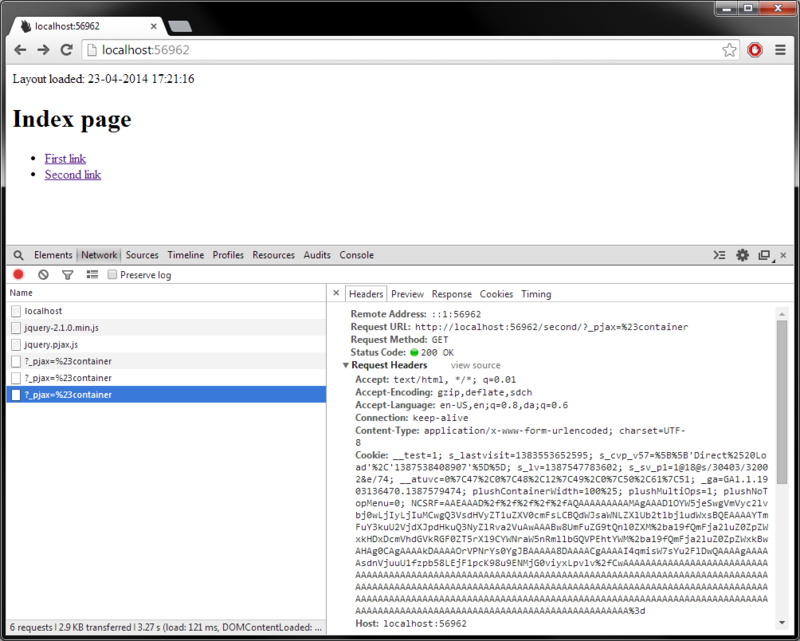 Because PJAX detects that we are returning the Layout HTML again, it fires a regular pageload. What we need to do is tell Nancy to forget about the Layout page if we see this header. I’ll do this everywhere I set the Layout in Razor. In my demo it will be Index.cshtml, First.cshtml and Second.cshtml. The reason is that PJAX will inject the content of your pages into the existing DOM. The “wrong example” only hooks up to instances of my #MyButton on intilization, but PJAX injects #MyButton after initilization. 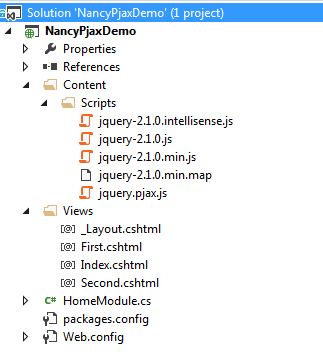 The full source of this demo is available at GitHub: https://github.com/jhovgaard/nancy-pjax-demo. Alright, I’ll make this quick since most of you will know this already. CSRF stands for Cross-Site Request Forgery. What it bascially means is, that you make one website do a request to another website, without letting the user know. To ensure that a request is coming from your own website, we have to push a unique string into a hidden input in every form that we post - this is called the AntiForgeryToken. If you want to know more about CSRF go check out the Wikipedia page, it’s actually very well explained. Enable CSRF support in the Bootstrapper. Insert the AntiForgeryToken in every <form> element of our application. Validate the posted CSRF token using the built-in Nancy Helper method ValidateCsrfToken(). Handle when Nancy can’t accept a given token (or if none is provided). Alright, you should already have some views in your application, one of them containing some form. In my example I’m using Razor as the viewengine. To add the AntiForgeryToken to my form I simply add Html.AntiForgeryToken() to anywhere inside my <form> element. When the user clicks my submit button their browser will send my application the value of the AntiForgeryToken/CSRF token. We need to handle this. Nancy have a builtin method called ValidateCsrfToken(). The method will automatically lookup Request.Form.Ncsrf and throw a CsrfValidationException if the token is not valid. 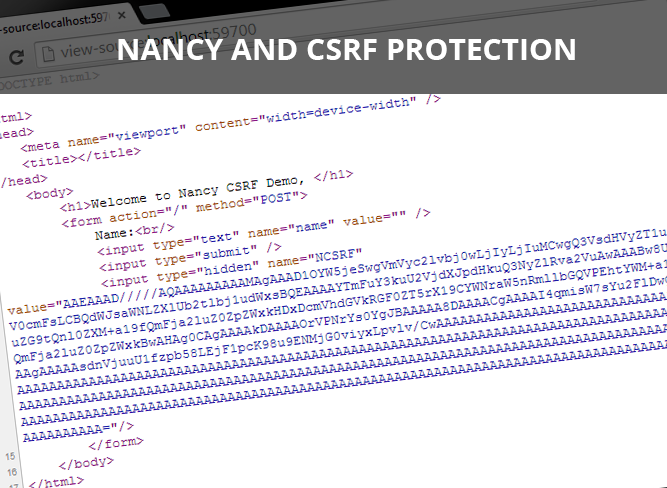 That is how CSRF protection works using Nancy. Please notice I’m not showing best practice here. You should move the try-catch into a BaseModule (maybe use the Before hook), there’s no need to copy/paste that code into every action of your application.